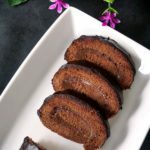 Chocolate Cake Roll or Chocolate Roulade, a delightful dessert for all the chocoholics out there. To make the sponge, make sure that the eggs are at room temperature before you start. Preheat the oven to 180 degrees C / 375 F.
Add the caster sugar and continue to beat until it forms stiff peaks and it’s has a shiny meringue-like consistency. Add the egg yolks one by one and mix well. No need to use a mixer from now on, a silicone spatula would do just fine. In go the flour, oil, cocoa powder, baking powder and vanilla extract. Fold in the ingredients gently, making sure the batter is smooth and lump free. Line a rectangle baking tray with non-stick baking paper and spread the batter evenly. Bake for about 10 minutes until the sponge is well risen. Pour the double cream in a pan and place on a low heat. Break the chocolate into pieces and add them to the pan. Stir gently so that the chocolate can melt, then remove from the heat, mix in the butter and leave to cool completely. For the chocolate glaze, combine all ingredients together, then leave to cool. Spread the chocolate cream over the sponge, leaving about 1-2 cm around the edges, then carefully roll into a big sausage. Pour the chocolate glaze over, then refrigerate for at least 3-4 hours.